Wash rice a couple of times in cold water until the water runs clear(ish). Put rice and water into a large Claypot. Bring to a boil and then lower heat and simmer for 10 minutes. 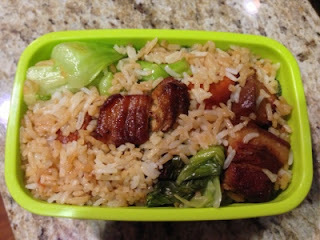 Uncover and quickly put in the Bok Choy on top of the rice and top with pork belly and the sauce. Cover and simmer for another 10 minutes. Turn off heat and let stand COVERED for another 15 minutes before serving. Mix everything together and then serve in bowls. Garnish with green onion (optional) and enjoy! You can always drizzle more sauce over the rice before eating. It's so good!!!!! So very decadent. You might need a little more pork belly though with all that rice. Or you can just lessen the rice. I love rice, so it was good for me. 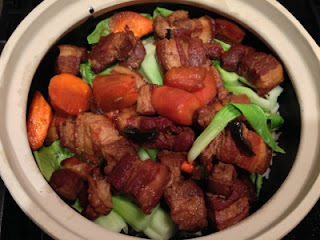 But normally people like to eat more of the pork belly like my Hubby so then more pork belly or less rice would be a good idea.